In a historic day of action, more than a million students from over 3,000 schools walked out of classes to protest gun violence on Wednesday [March 14]. Walkouts occurred in all 50 states as well as some schools overseas. The nationwide student walkouts occurred one month after 17 students and staff were shot dead at Marjory Stoneman Douglas High School in Parkland, Florida. At many schools, students walked out for 17 minutes—one minute for each person murdered in Parkland. The students at Marjory Stoneman Douglas High School are now organizing a massive March for Our Lives on March 24 in Washington, and solidarity marches are planned across the country. 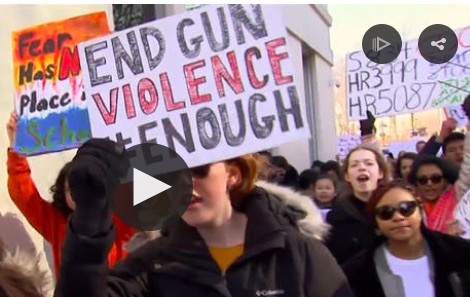 We air moments from marches in New York and talk with Luna Baez and Citlali Mares, two students in Denver, Colorado, who helped organize their school’s walkout for gun reform Wednesday. NERMEEN SHAIKH: In a historic day of action, more than a million students from over 3,000 schools walked out of classes to protest gun violence on Wednesday. Walkouts occurred in all 50 states, as well as some schools overseas. This was the scene outside one school here in New York City. PROTESTERS: No guns, no violence! No guns, no violence! No guns, no violence! No guns, no violence! No guns, no violence! No guns, no violence! No guns, no violence! CHELSEA: My name is Chelsea. I go to the High School of Fashion Industries. And today we’re here to protest against what happened at Parkland. We’re here to stop gun violence in schools and everywhere. PROTESTERS: I’m a student, not a target! I’m a student, not a target! I’m a student, not a target! I’m a student, not a target! LAURA RICHMOND: My name is Laura Richmond. I go to High School of Fashion Industries. And we’re here protesting gun violence all across America. Guns don’t solve problems, they create problems. And obviously, as you can see, we all feel strongly about this. This is something that’s been going on for far too long. And if people—if adults aren’t going to take action, we need to take action. PROTESTERS: No guns, no violence! No guns, no violence! No guns, no violence! No guns, no violence! KAYLA CONCEPCION: My name is Kayla Concepcion. I go to the High School of Fashion Industries. We are protesting to disarm the NRA and the mass school shootings that has happened across the country. It has to end now. And it starts with every school protesting. And we are here today to stop this shooting! Today! Every school should walk out right now and go and protest! PROTESTERS: Disarm the NRA! Disarm the NRA! Disarm the NRA! Disarm the NRA! Disarm the NRA! AMY GOODMAN: The nationwide student walkouts occurred one month after 17 students and faculty were shot dead at Marjory Stoneman Douglas High School in Parkland, Florida. At many schools, students walked out for 17 minutes—one minute for each person murdered in Parkland. The students at Majory Stoneman Douglas High School are now organizing a massive March for Our Lives on March 24th in Washington, D.C. Democracy Now! will be there, broadcasting live the entire march. Solidarity marches are planned for across the country. In Brooklyn, New York, a walkout occurred at Edward R. Murrow High School. ANASTASIA BEIRNE-MEYER: We are standing here today, halting our education to show that we will not be living in fear of a school shooter. We will not be next. We will not sit in our classrooms wondering why Congress is not working as hard as we are. We will not overlook the fact that it is the students’ responsibility to speak out against the dangers of guns. And I’m not just talking about mass shootings. I’m talking about the militarization of our law enforcement and the normalization of these weapons in our communities. We will not let our future be dictated by the millions of dollars from the National Rifle Association that prevent stronger gun laws. AMY GOODMAN: We begin today’s show in Denver, Colorado, where we’re joined by two organizers of a student walkout at Kunsmiller Creative Arts Academy in Denver, Colorado. We’re joined by Lali Mares and Luna Baez. Luna is the daughter of the undocumented activist Jeanette Vizguerra, who’s one of the founders of the Metro Denver Sanctuary Coalition. Jeanette Vizguerra took refuge, sanctuary, in Denver, but now is now out, because there is a private bill that protects her. Luna Baez and Lali Mares, we welcome you both to Democracy Now! Luna, let’s begin with you. Talk about what happened yesterday at your middle school. LUNA BAEZ: What happened yesterday at our middle school was we walked out in support of better gun laws and for the 17 that fell during the Parkland school shooting. NERMEEN SHAIKH: You talk about what kind of response you and Luna received when you started to organize this protest. What did teachers and students at your school say to you? CITLALI MARES: Some of our teachers were very hesitant about the walkout. A lot of them supported us, but we knew that there are some that weren’t going to be able to help us to the maximum we needed. And then the students felt like it was very important, and it was important for them to walk out with us, because they knew that it affected them in a very big way. NERMEEN SHAIKH: And what about your school principal and other school administrators? CITLALI MARES: We didn’t hear much about our principal. Our vice principal was out there while we were walking out. So, it was good to have that kind of support while we were there. AMY GOODMAN: Luna, can you talk about why you chose to be one of the organizers of this protest? And what grade are you in? LUNA BAEZ: —and the other students. Yes. AMY GOODMAN: And would you say that experience comes from organizing around your mom, Jeanette Vizguerra? AMY GOODMAN: And do you see these issues as linked? Can you talk about your mom just for a few minutes? I visited her in Denver at the Unitarian Church, where she had taken sanctuary, before she was able to come out because she’s protected by a bill that was passed in Congress. LUNA BAEZ: So, I would say it would be linked, because my experience with media and all things related to that are from my mom’s process. AMY GOODMAN: And, Lali, why did you choose to help organize this student walkout? And what demands are you making of President Trump, of Congress, of the NRA? CITLALI MARES: I chose to organize, to help organize the walkout because I knew that this wouldn’t just affect us as a school, it would affect everyone in the United States and out of the United States, because this is something that’s bigger. And with a bigger group of students, it can allow us to create a bigger impact. And I would just want the president to pass something that says that we can—we have better laws about guns, not necessarily taking away the guns, but nobody needs that type of weapon in their house, where somebody who doesn’t need that has it in their hands and something like Parkland can happen. NERMEEN SHAIKH: And, Lali, how many students participated from your school in the walkout? Were you surprised by how many did or how many didn’t? CITLALI MARES: Yes, we expected maybe 20, 25, 30. We didn’t expect that big of a group, and we thought it would just be eighth graders walking out with us. As Luna and I were walking the halls, we noticed that high schoolers were joining some of the sixth and seventh graders. So, I would say about 70, 80. It wasn’t a big a—like a big size, but it was large for us as our first walkout. AMY GOODMAN: And, of course, 2,000 Denver-area students also walked out all over, many marching to the state Capitol. I want to thank Luna Baez and Citlali Mares for joining us from Kunsmiller Creative Arts Academy in Denver, as we go back to more voices from the nationwide student walkout on Wednesday. PROTESTERS: No more silence! End gun violence! No more silence! End gun violence! AHRIANA MERRYWEATHER: All these people have come together today so that they can express how they feel about gun violence and all these things and how kids don’t feel safe in their schools, which is the one place we should feel safe, because that’s where we spend most of our time. REEM ARAJAI: I hope that the president will step up, stop accepting money from the NRA, because if all of the deaths that have occurred aren’t enough to convince him, then I guess it just has to be us protesting right now. SIMONE HICKS: If you can protect guns this much and don’t have the same regard for the people who are going to create your country in the future, then we’re in trouble. The kids are the future. If you’re not protecting the kids, then what’s left? PROTESTERS: I call BS! I call BS! I call BS! NUPOL KIAZOLU: My name is Nupol Kiazolu. I’m 17 years old, and I’m president of the Youth Coalition for Black Lives Matter New York. I’m out here also because I lost my father to gun violence, and I lost many family members and friends to gun violence. Gun violence is not a new issue. It affects our communities every single day, and it affects black and Latino communities disproportionately. I came here to give honor to those 17 lives that were lost, because those people were heroes. But we don’t need any more martyrs. We need justice. And that starts here and now. PROTESTER 1: This is about people—gay, straight, black, white, religious, nonreligious—coming together so their kids don’t have to be afraid to go to school. CAROLINA THOMAS: Hi. My name’s Carolina Thomas, and I’m 12 years old. And I’m here today because I’m sick and tired of hearing that someone has died at school innocently. I am sick and tired of hearing that someone has been killed at school while learning how to read or write. Why are we fighting for something that the adults should be fighting for? Why are we here marching and walking out of school, when the people of Congress should be protecting us? PROTESTER 2: It makes sense to me that the only problem is the guns. Get rid of the guns, get rid of the violence. We have the most guns than any country on the face of this world. We’re the richest country that’s ever existed on the planet, and we can’t deal with these issues? It doesn’t make any sense. PROTESTERS: Donald Trump, Mike Pence, gun control is common sense! Donald Trump, Mike Pence, gun control is common sense! PROTESTERS: Enough is enough! Enough is enough! Enough is enough! PROTESTER 3: We grow guns. We place them in the hands of Americans and say, “Go play.” The inevitable senseless violence that follows is succeeded by senseless silence. AMY GOODMAN: Voices from the nationwide student walkout on Wednesday. It’s estimated about a million people walked out, not only in the United States, but calling for gun control all over the world, in solidarity with the students at Parkland. This is Democracy Now! We’ll be in Washington, D.C., on March 24th, covering the March for Our Lives, organizing the student survivors of Parkland, organizing around the Valentine’s Day massacre, calling for comprehensive gun control. This is Democracy Now! When we come back, we go to Alabama to hear about another school shooting, just a few weeks after Parkland, that hasn’t gotten anything like the attention of what happened in Florida. Stay with us.